Welcome to video #1 in my 3-part video series for how to restore digestive wellness! As a certified Nutritional Therapist who specializes in digestive health problems, I’ve recently created three videos that cover three very different but very important aspects for how to improve digestive health. Video #1 will discuss THE WHY. Today, I will detail why poor digestive health manifests. Because when you understand WHY things go wrong it’s much easier to understand WHAT to eat for good digestive health. Video #2 will discuss THE WHAT. I will show you exactly WHAT foods to eat to restore digestive wellness. Now these are not foods your doctor is recommending. It’s NOT as simple as eating more fruits, vegetables and whole grains. Millions of people follow this overly simplified formula for health and then wonder why their digestive health deteriorates. This video will make that very clear. Video #3 will discuss THE HOW. And the HOW is where the rubber really hits the road. That is, HOW to make the foods from video #2 practical and economical in every day life. Because as good as it is to understand things on an intellectual level, the putting-it-into-practice level is the most important. And this is where SO MANY people struggle in the context of our crazy modern day lives. 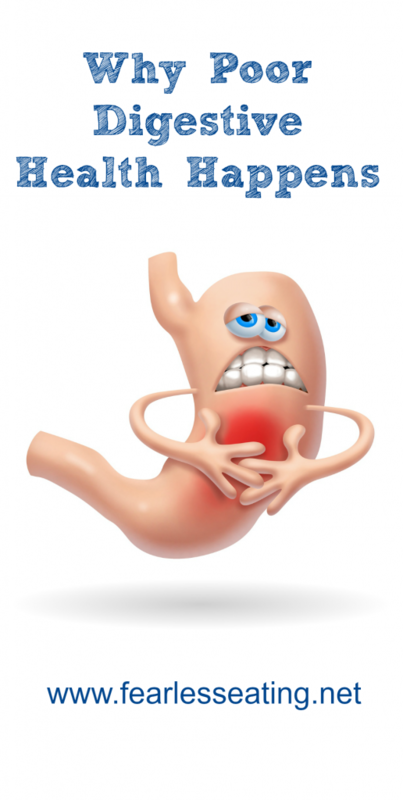 So let’s get to video #1 for how to restore digestive wellness! Now don’t worry. This isn’t boring, overly technical information. As you’ll see, I’ve broken things down in an easy-to-digest (pun intended) manner using simple analogies that can help you understand how digestion works and how easy it is for things to go wrong and manifest as heartburn, bloating, IBS, inflammation, gas, constipation, food allergies, etc.